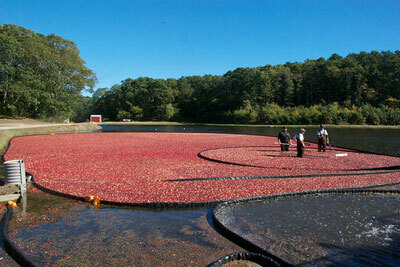 I have entered the bog, friends, and I have seen the cranberries. Such redness! So many shades! Reds you’ve never seen before. 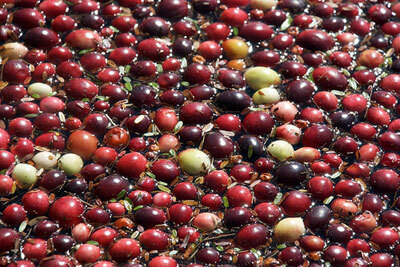 Purples that look red, reds that look rosy, and each one exploding with a taste so hypnotically tart you’ll think: Moses didn’t part the Red Sea…he was in a goddamn cranberry bog! The autumn wind whipped us, but not in a slave-like manner. It was crisp, almost gentle. 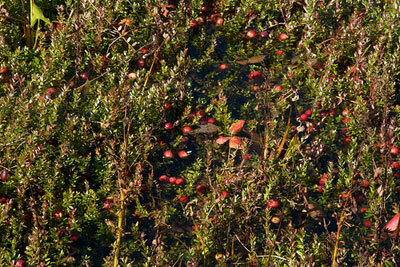 Once the bog was flooded, the berries floated to the surface. This was thanks to a farmer and his “water beater” which is the machine that plucks berries from their vines. 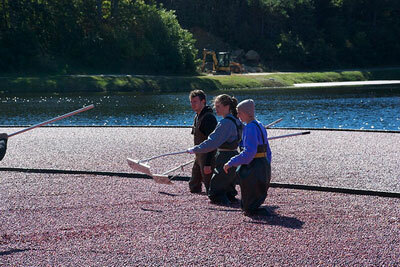 As we hiked up our waders, those already at work used long rubber tubes to corral the berries. They were cowboys with lassoes, and the berries were tiny and confused ponies. Scattered, no more. Meanwhile, a semi-truck pulled up next to the bog. That was our cue to enter the abyss, for we had a truck to fill. We would use our metal brooms to push the berries into the center of the corral. At the center, a long tube, reminiscent of that scary scene in E.T., extended from bog to truck and sucked the fruit up in its path. 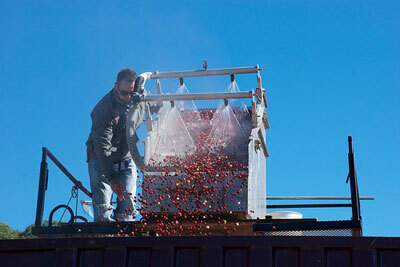 Near the end of the journey, a machine separated the berries from the vines and gunk. Our arms grew tired, but encouragement pushed us forth. In the distance, a land-bound Bostonian shouted: Round ’em up, fellahs! We got hot corn chowdah and pumpkin bread for yah. Just the words we needed to press on. The berries grew redder throughout the afternoon…so pretty. My waders leaked like an overly caffeinated elephant, but what a day. And now I’ve got some fine cranberry jam in the kitchen.